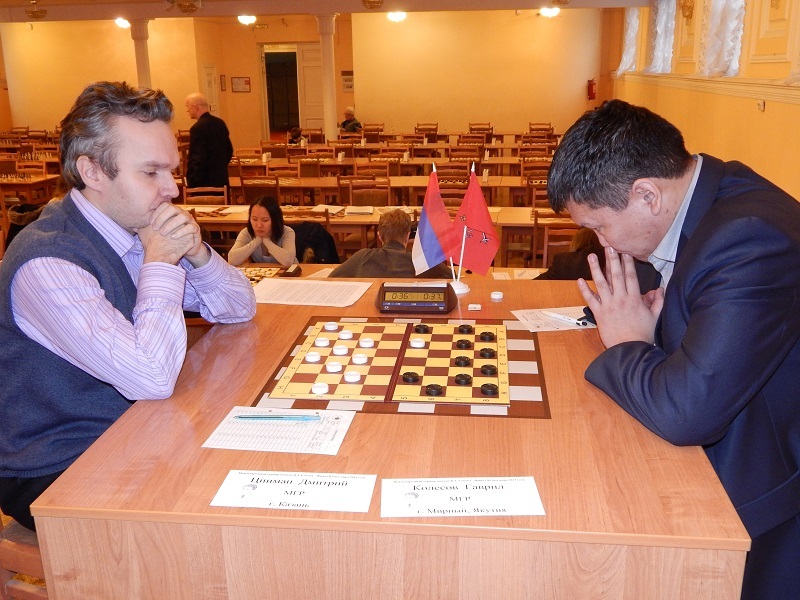 Final of World Cup 2013 – International draughts-64 competitions memory Vasily Sokov ended. 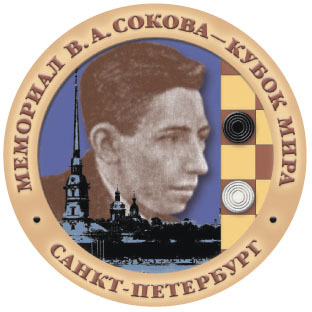 Sergey Belosheyev from Evpatoria, Ukraine, won in the last round Dmitry Melnikov and won Final of World Cup. 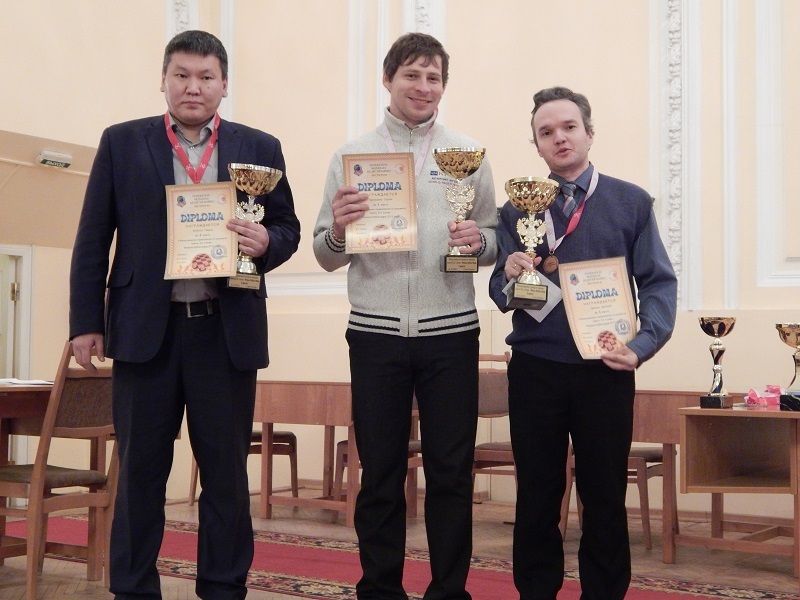 Gavril Kolesov took 2nd place and Dmitry Tsinman took 3rd place. Yulia Mosalova is the best among women. Dmitry Melnikov is the best among youth. Dmitry Sirotin from Dzerzhinsk won Youth tournament. Team SDUSSHOR from St. Peretsburg won in the team classification. In the 8th round Sergey Belosheev won Mikhail Kiselev and Gavril Kolesov won Vladimir Merkin. Before the last round Belosheev ahead Kolesov by 1 point. Winner of the tournament will be determined tomorrow. 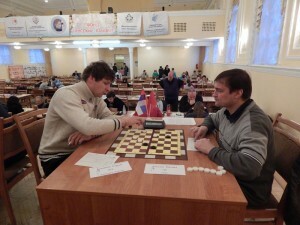 Dmitry Tsinman and Dmitry Lond shared 3-4 places. After lunch the participants traveled on a tour of St. Petersburg. Two rounds are held today in the World Cup. 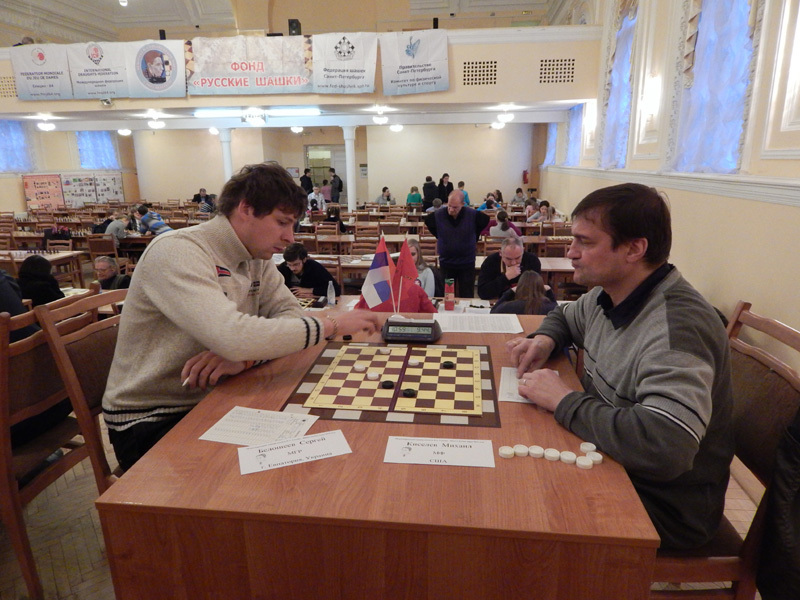 Central game of morning round between Gavril Kolesov and Dmitry Tsinman ended a draw. Sergey Belosheey won Dmitry Lond and went to the top spot in the table. Sergey Belosheev won Ruslan Pescherov in the next round. He continues to lead after 7 rounds. Gavril Kolesov are in the second position. Dmitry Tsinman and Mikhail Kiselev shared 3-4 places. Today was the 5th round. Gavril Kolesov and Sergey Belosheev played together. The result is a draw. They are, as before, leading in World Cup with a score of 9 points. 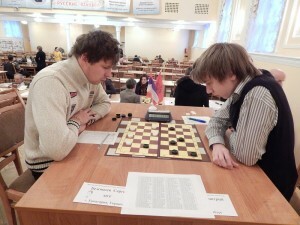 Dmitry Tsinman won Pavel Chirkov and moved to the third position. 4 player lead in Youth tournament with a score of 7 points. Two rounds are held today in the World Cup. Sergey Belosheev got an important victory in the morning round over Dmitry Tsinman. 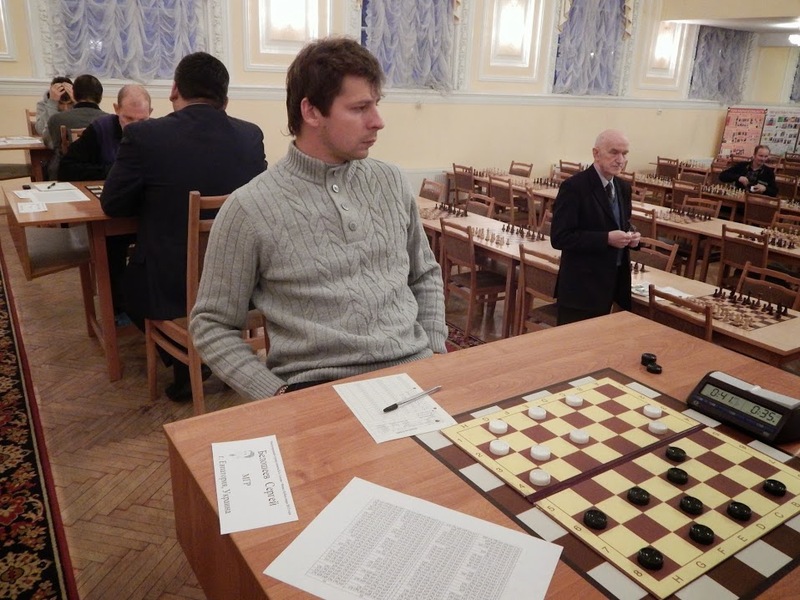 Gavril Kolesov, Sergey Belosheyev and Pavel Chirkov lead after three rounds with a score of 6 points. In the next round Sergey Belosheev won Pavel Chirkov and Gavril Kolesov won Mikhail Kiselev. They continue to lead after four rounds with a score of 8 points. 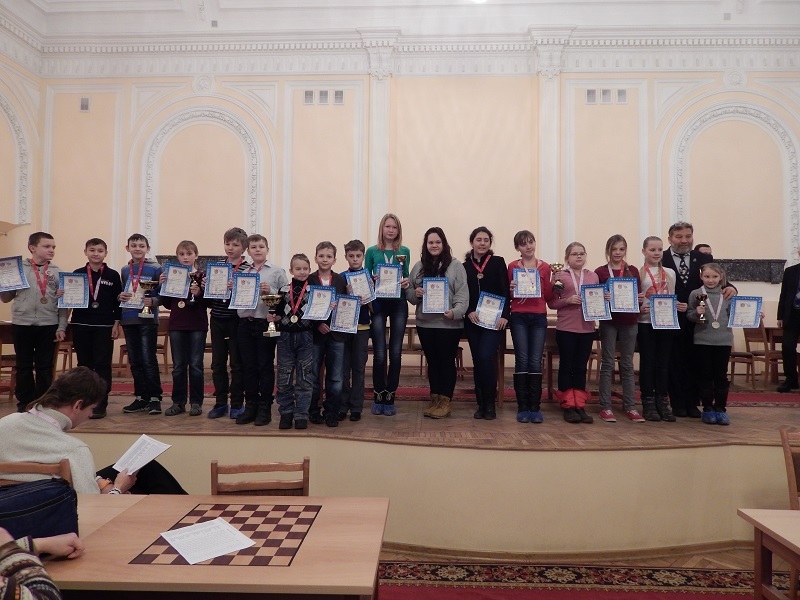 Vekovschina Yulia (St. Petersburg) and Markova Irina (Arkhangelsk region) lead in Youth tournament with a score of 6 points after three rounds. 76 players participated in 2 tournaments – World Cup and Youth tournament. 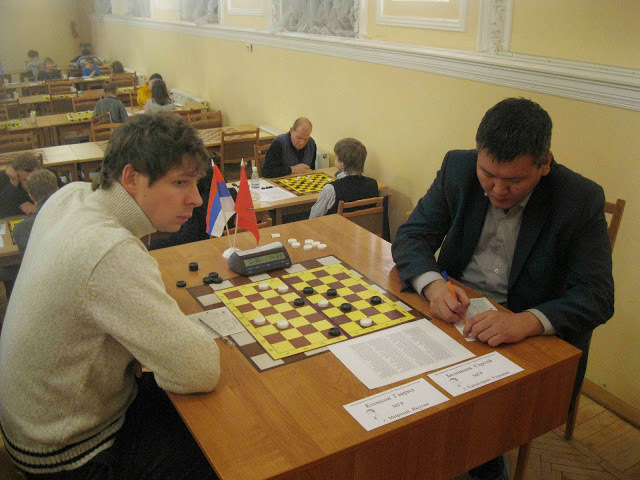 The first and second players from world rating Gavril Kolesov and Sergey Belosheev fighting for the prize places in the World Cup. The opening ceremony took place at 12.00. Legendary champions Harm Wiersma and Anatoly Gantvarg welcomed the participants. 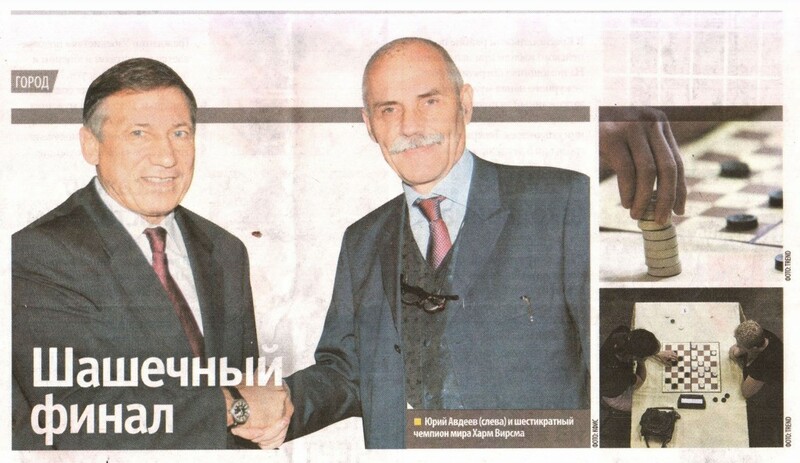 After the opening ceremony meeting of Harm Wiersma, Anatoly Gantvarg, president of the International Draughts Federation Vladimir Langin and a member of the St. Petersburg government, the head of the sports committee Yuri Avdeev was held at the Sports Committee of St. Petersburg. The FMJD Section-64 – IDF in accordance with the calendar of the Section-64- IDF competitions in 2013 holds from 08 December (arrival day) to 16 December (departure day) 2013 in St. Petersburg, Russia, Final of World Cup 2013 – International draughts-64 competitions memory Vasily Sokov.